Cramps, bloating, heartburn, you've had it all. But if your digestive tract is constantly troubled, it could be a result of going through perimenopause. Perimenopause, the phase before menopause, is actually a major cause of digestive problems for women aged 45 to 55. If you're one of those women, read on to find out how you can relieve your pain. 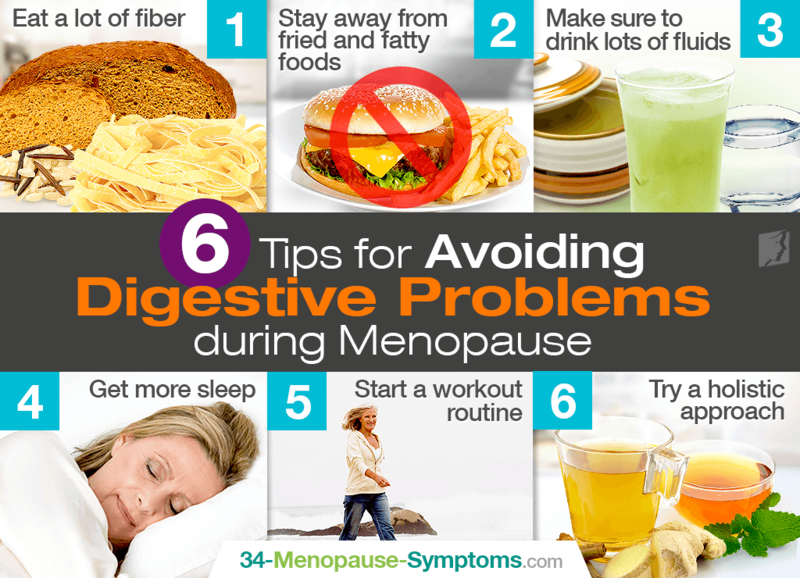 During menopause, digestive issues are often caused by the interaction between cortisol and estrogen. Cortisol, frequently called the “stress hormone”, is produced when you feel stressed out. This hormone inhibits proper digestion, but is usually counteracted by estrogen. When estrogen levels decrease during menopause or perimenopause, cortisol has a greater effect on your digestive system. Digestive problems include cramps, diarrhea, bloating, gas, heartburn, and constipation. These common sense strategies can make a big difference when fighting digestive problems. Whole grains and other foods high in fiber, such as whole wheat breads and pastas, brown rice, and oatmeal, act as a cleanup crew for your digestive system, making sure the intestines and colon stay clear and eliminating constipation. Aim for the American Dietetic Association's recommended daily amount of 25 grams. Especially if you have heartburn, these foods can increase your discomfort when digested. Try to limit your alcohol intake because it slows down the digestive system. Most people only think of water, but fluids also include soup, broth and juices (just watch out for the sugar content). Fluids break down foods during digestion and can help avoid constipation. Water also helps to neutralize stomach acid, reducing heartburn. This is essential for activating your parasympathetic nervous system, in charge of how your body rests and digests food. Try sleeping on the left side of your body because research shows this position is better for digestion. Getting at least 7-8 hours sleep each night also helps eliminate heartburn. Exercise as simple as brisk walking a few minutes each day can help your body move gas through the digestive system quicker, which relieves bloating. Alternative medicines such as herbs, natural supplements and acupuncture can help with many digestion problems. Also, try having a cup of ginger or peppermint tea after eating to ease your digestive system into the task of breaking down your food. Women experience digestive problems twice as much as men do. If you are experiencing digestive problems, consider making lifestyle changes to your diet and fitness routine. Click the following link for more information about how to avoid digestive problems. University of Michigan Depression Center. (n.d). "Women and Depression: Menopause". University of Michigan Depression Center. Retrieved from www.med.umich.edu.